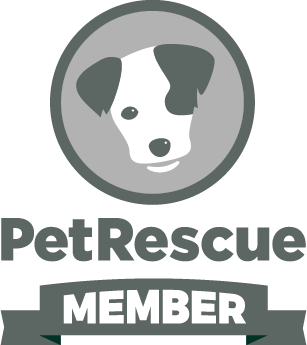 Fetching Dogs is an incorporated non-profit registered charity, dedicated to rescuing, caring, and rehoming dogs all across NSW, as well as the promotion of responsible pet ownership and education regarding animal welfare. All of our dogs are desexed, microchipped, vaccinated, wormed, flea and heartworm treated. Our foster dogs stay in care for a minimum of two weeks in order to properly asses both behaviour and health. We are passionate about rehoming responsibly and matching our dogs with compatible families, to ensure their second chance will be for life. We also assist in rehoming and promoting other dogs in need of homes. If you would like some help or advice, please contact us and we'll do all we can to assist you. Airis the Helen Mirren of the dog world! Ageing gracefully, charismatic to be around and full of love and admiration. She is no trouble in a smaller home as she indulges in frequent morning and afternoon naps, in fact she sleeps so soundly she could easily sleep anywhere the is a super comfy large bed, and a bowl of water. Airis does need several outings a day and loves to stretch her legs, she can even keep up a good jogging pace for a short while.She is wonderfully house trained and will let you know when she needs to be let outside. She gets along well with other dogs and needs a companion who will show her the finer art of dog play. She would be great with another older dog, or an only dog for a senior family. 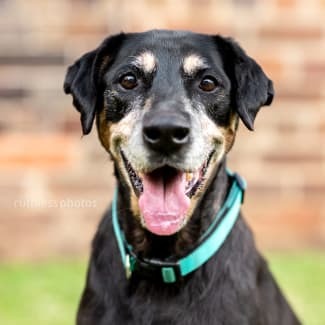 Whilst she is great with kids she is moving into her golden years and deserves a little R and R. Airis LOVES car trips and loves to watch the excitement of the world wiz by, she is beautiful natured and will give you back love in spades. If you are looking for an easy going companion to share journeys with, enjoy the outdoors with and keep you active (all at a slightly slower pace) , Airis is your girl. If interested further, please complete the adoption enquiry form via our Fetching Dogs website as the next step. Puppies are always cute but this boy is to die for! His personality is one that melts your heart. Soft natured and a big goof! Castiel loves to plod around the house enjoying the surroundings, smelling or eating the fresh flowers! He is very clever, easy to train boy and listens well to correction. He sleeps on his bed at night quietly and is learning that the toilet is outside. This man is one for adventures! No happier place then the car to get you there! He loves cruising along on the back seat with the occasional head out the window with those funny ears flapping all directions in the wind. Dog social is an understatement. 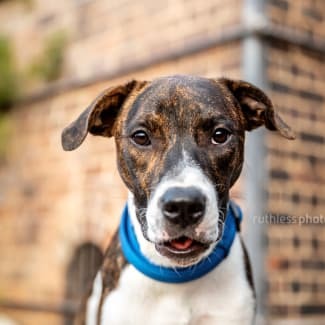 Castiel loves dogs, enjoys their company, a great play mate bouncing around throwing toys in the air and playing chasing. The best things in life are not always perfect and this gorgeous boy is a perfect imperfection! He was born with an angular limb deformity. He has had a CT scan and X-rays and was seen by a specialist who advises that our only course of action is amputation of the leg. Whilst he is a large dog, he should cope well both mentally & physically with this change. The surgery has been performed and he's recovering well in foster care. The family who steps up to the challenge will not be disappointed in the love he will show you in return. The worst things always happen to the best of us. Balthazar has not been officially diagnosed, however, the vet and I are fairly confident he’s deaf. This doesn’t stop his positive attitude, willingness to learn or his unwavering ability to trust. He’s a bit clumsy at times but is currently learning sit , wait for food and check back for hand gestures on instructions. He's also becoming much more comfortable with car travel too. Balthazar will be a big boy once fully grown and still likes to climb up for cuddles but he's learning to have patience and wait till he's told it's ok. He is fabulous with everyone and everything and is currently living harmoniously with dogs, cats, birds and children of all ages. He’s still learning to walk on a harness properly and he likes to stay close, even walking right between my legs as he can't hear what's going on and finds comfort in close proximity. He loves playing with his foster brothers and sisters, especially tug with rope toys and water is just the best thing, he adores lying in the baby pool! He'd make a wonderful beach or river companion or even just a swimming buddy in the pool. Baz is coming a long way with training, despite his lack of hearing and has the most wonderful sweet nature and a great attitude to life. Baz will need a home committed to his ongoing health, happiness and training. He will require a home with another older yet playful dog that he can use for guidance in life and be his ears. He is smoochy, so cuddles are a must! It's preferable that the humans are home more often than not to help with his training and guidance. He should have a safe, soft bed inside to sleep on at night. 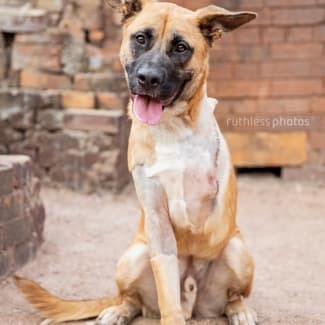 If you feel you can offer this gorgeous boy a loving, dedicated home, please apply by completing the adoption enquiry form via our Fetching Dogs website as the next step. Looking for a fitness buddy? Or want a tennis partner and too lazy to get your own ball? Mr Merlin is in need of a motivator to loose some weight! 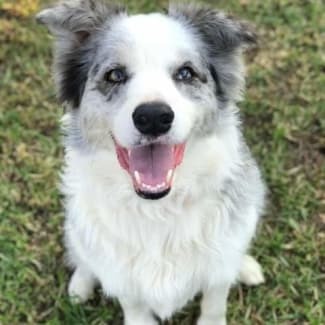 Merlin is a 7 year old Border Collie that has had a very basic life and is hoping to see more of the world! He was an outside dog, walked daily but never part of the running’s of a family household. This is all new to him but he loves the attention and to have people around him! The smile on his face when your by his side goes from ear to ear. He is a very obedient dog. His commands are on point. Sit, drop, shake are all a piece of cake. He is very smart and eager to please. Merlin is learning the luxury of being an indoor dog, when people are home and is learning to settle and sleep on his dog bed. During the day he is happy to explore the yard. His favourite time is walks or fetch! Let him show you his moves and grooves as he jumps to catch the ball. He is a good sport and will bring the ball back ready for the next round. His walks are his excitement. Starting the walk he will do swift circles around you (never tripping you) but to remind you he is a sheep dog and the circling comes natural. He loves his exercise and does need some extra to remove some of that extra weight! He doesn’t need that much extra warmth for winter. Merlin has never had real friends that he could play with. He is looking for a family that will work on his confidence to embrace making friends in a controlled positive environment. This is not dog parks, but family and friends dogs that you can walk together and have a play in the backyard while supervised. He is not aggressive towards dogs just unsure and needs confidence around them, would run away and avoid if a dog wants to play. Group dog training classes would be great! Or even try agility he would be the top of his class! His hates which he will personally tell you about: Storms – he will bark at the sky and tell it to go away (never tries to escape or is scared) Car trips – he has only been in the car for vet trips so we are working to show him car means calm and not to bark. 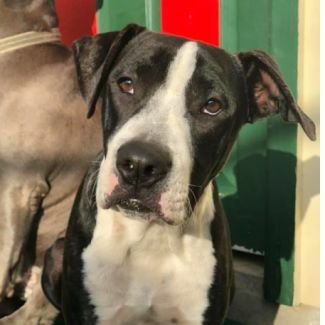 Merlin has been set in his ways for a long time now and will take a while to understand and feel confident with new life’s adventures and routine. His family will need to have a confident love to ensure they doesn’t encourage and anxious behaviour but to encourage him in a confident and supporting way. We are looking for a family preferably with a love of Border Collies that understand their traits and behaviours and show Merlin the full potential of life! He is an amazing stunning boy with a lot of love to give. His excitement to see you will automatically feel happy walking in the door. If you think you have the family to fit Merlin into please fill out an application.